Above: At The Old House, Hereford. My interest in medical matters is in my blood: my paternal grandmother was a "woman who birthed people and laid them out" and on my mother's side my ancestors were named Leech (from the Saxon "Laece" meaning healer). 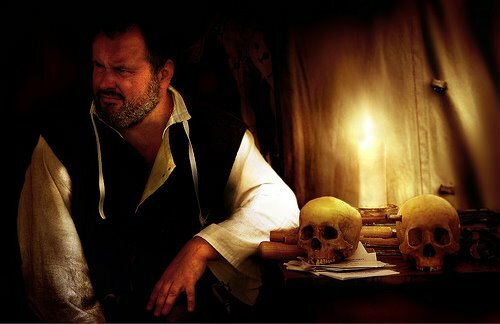 I have been a professional Historical Interpreter since 2005 and my interest in the many aspects of medical history has grown. I strive to bring academic rigour to my displays and presentations so all aspects have been thoroughly researched using primary and secondary sources. 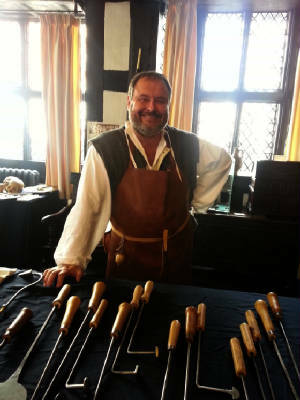 I have been the resident medieval surgeon for Tewkesbury Medieval Festival for a number of years and regularly appear at Hampton Court Castle, Leominster, The Commandery Worcester; Ludlow Castle and a number of community historical festivals.I have also worked for the National Trust and English Heritage. I have written a number of books and articles on aspects of medical history. When not performing or speaking around the country or researching I work at the Black Country Living Museum, where, I can often be found discussing matters of a medical nature.